In Spain, the giant of cancer and ageing research, Carlos Lopez-Otin has fallen over the many data manipulations in his papers, while an anti-scientific uprising of corrupt politicians and crooked academic elites decries my ETA-like terrorist conspiracy against a martyr saint, fed by fascistoid press calling for the heads of falsely accused scapegoats at his University of Oviedo. Lopez-Otin recently destroyed all his transgenic mice, allegedly over an infection, and now raves from his Paris exile about the injustices he as a scientist with h-index of 100 gets to endure. In France, also in Paris, another Jesus figure recently also fell over similarly Photoshopped data, despite massive support from her peers: the developmental biologist Catherine Jessus resigned on February 1st as director of CNRS biology branch INSB, replaced by Ande Le Bivic and now remains merely a humble Sorbonne University professor. At the same time, another alleged victim of injustice and conspiracy, the French plant biologist Olivier Voinnet, exiled to ETH Zürich, found guilty of fraud, tainted with 8 retractions and over 20 embarrassing corrections, wants his reputation restored. His simple argument is of double standards: his data manipulations were deemed fraudulent while those of Jessus were declared the correct way to do science. The investigator of both Voinnet and Jessus namely was a personal friend of the latter, the Sorbonne plant biochemistry professor Francis-Andre Wollman, member of Academie des Sciences and Knight of the Honour Legion. Turns out, also papers co-authored by Wollman contain manipulated data. Wollman was investigator of both Voinnet in 2015 and Jessus in late 2017. The latter fact was uncovered on my site, thanks to a whistleblower, the former was leaked by Voinnet himself as soon as ETH unmuzzled him. How things changed in between those 2 years. Copy-pasting of gel bands in Photoshop suddenly became an example of good scientific practice, and so Jessus was acquitted in full. Which rule will Wollman apply to his own papers, where same kind of image irregularities was found as in works by Voinnet and Jessus? 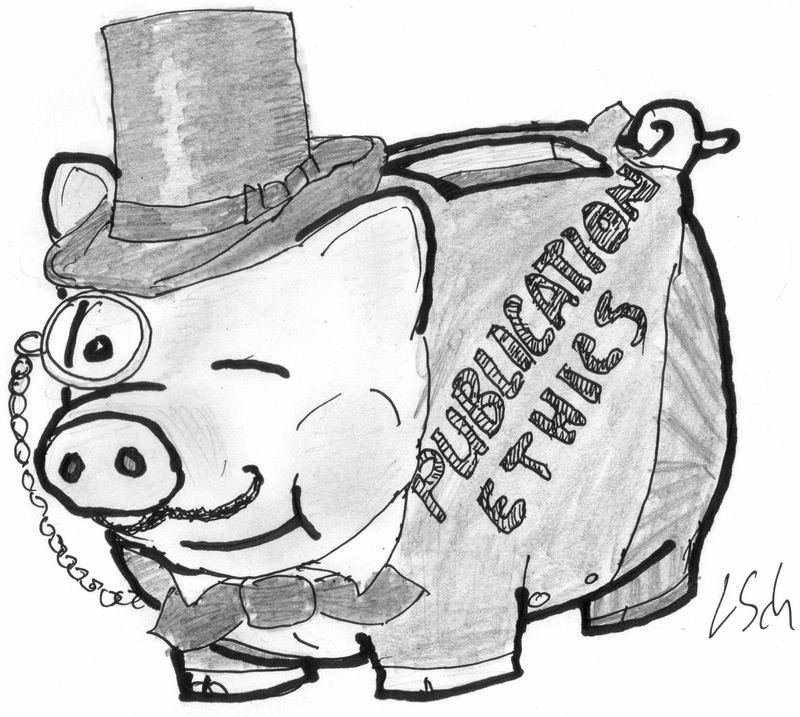 Does the distinction between research misconduct or good science depend on who does it? Is anyone responsible for anything at all? Does life science need data to be credible? “For an article by Nature Genetics in 2013 [Mari-Ordonez et al 2013, -LS], faced with the opposition from publisher to issue corrections, he asked ETHZ to publish them as their own imprint. “It would have allowed my former student to have a complete resume, without hiding the problem with this article,” says Olivier Voinnet”. The first author Arturo Mari-Ordonez is now group leader in Austria, and he had to correct his PhD thesis due to manipulated data. Now I understand why ETH refused me access to this dissertation back in 2015. As for the journal’s peculiar refusal to issue a correction: the journal’s former Editor-in-Chief Myles Axton departed to work with Wiley (incidentally, also he had some inappropriately presented data in his own papers), and the new editorial team seems to have little say on such matters. Instead, I received a reply from Springer Nature Head of Communications, Rebecca Walton, who refused to either confirm or deny what Voinnet told Le Monde. Three times I put the above Le Monde quote to her, and all I got back was an instruction to write something unspecific about Springer Nature being committed and confidentiality. Soon after, a tweet of mine where I questioned Nature editors’ qualifications and responsibilities, was instrumented by another Nature journal editor (formerly with Nature Genetics, strange coincidence) to set off a campaign accusing me of harassment of women, but also of editors and scientists in general. So it seems Voinnet did not lie. Nature Publishing Group probably closed the case after discovering that it all was once again only my trolling. “For four figures, these are honest mistakes, inadvertent copying and pasting of control bands. They are reused in three separate articles, for which the editors request corrections, accepting the unintentional mistake and noting that originals have been submitted or that other articles have confirmed the results. Note that in one of these cases, Olivier Voinnet admits having used a “mock-up figure” in the article. These mock-ups are usually built for internal presentations or drafts to see what the final version will look like. It is like when a “dream” becomes “reality”. For two figures, East Anglia’s experts note an intentional alteration of the images. And for good reason, the then-doctoral student used a software to erase some unsightly dots in the background of an image, without affecting the data itself. Nevertheless, the editor of EMBO Journal decides for this reason to retract the article [Brigneti et al. 1998, -LS] (the original data could not be found). “I did not know it was happening at the time,” confesses the biologist today who adds that “it grips me at my throat”. He reluctantly accepted the publisher’s decision, citing the age of publication and its high citation rate”. Data fakery aside, that Science 2006 paper is scientifically utterly worthless, even according to Voinnet’s own follow-up publications. Yet there it is, never retracted and thus fully trustworthy. “he stresses relentlessly the “double standard” which seems to have been shown in other recent investigations in his field, particularly that relating to the scientific output of Catherine Jessus, director of the Institute of Biological Sciences (INSB). First, he notes that some manipulations of figures that he is accused of appear to be in the same category as those that got “accepted” for the director of the INSB. Then he notes that the absence of original data does not bother anyone in the case of his colleague. In addition, he points out that he was sanctioned as a team leader, which again is not blamed on the biologist [Jessus]. And finally, he accused the CNRS management of having done everything “to see nothing, do nothing” to determine the real responsibilities for the accusations he had to face”. “20% of figures” would be wrong because of him. “It was speed, bad work, because it did not interest me to assemble these figures”, he added. He also acknowledges that, without these shortcuts, “we would have been slower and that it could have affected [his] career”. In an interview with Newstank, Inspector Voinnet positioned himself as the main investigator of his own fraudulent papers. He protests as to why he was not given access to his Strasbourg lab notebooks when the CNRS investigation started in 2015, so he could have exposed Dunoyer’s fraudulent activities earlier. Good point. But then imagine, purely hypothetically and for argument’s sake alone, Voinnet was not a paragon of ethics, but actually an extremely cunning fraudster himself. He would have used the opportunity to rig or destroy vital fraud evidence, wouldn’t he? It is now very reassuring to know that ETH let him have access to all such evidence at the Zürich lab during all times, right? These days, Voinnet is not the perpetrator, but one of research integrity experts, basically the man who, while himself harassed, gagged and persecuted, single-handedly exposed the biggest fraudster in the history of plant sciences: Patrice Dunoyer. Guaspare C and Didier E (in press) The treachery of images: The Voinnet affair. In: Biagioli M and Lippman A (eds) Metrics and Misconduct: New Ecologies of Academic Research. Cambridge, MA: MIT Press. “Would you have had the same career without what you have been criticized? “asks Emmanuel Didier, researcher at EHESS, the biologist [Voinnet,- LS]. “The answer is yes. It probably would have been slower since you have to work a lot to reach the standards I set myself but which are well beyond a standard laboratory. One has richly deserved what one does but one does it. However, it is not me who decided that I was a star, it was other people who starified me and these are the same that destarified me then. Would I have had such a meteoric career? Probably not. Does this fundamentally change our scientific discoveries? No, “replied Olivier Voinnet. Pass the puke bucket. Back in 2015 I could not find a single scientist in the entire world who would have confirmed Voinnet’s central discovery of siRNA as mobile distance antiviral silencing signal in plants. But many said his results were not just irreproducible, Voinnet’s own papers contradicted themselves. The original whistleblower in Voinnet affair, US plant scientist Vicki Vance, not only caused the very first Voinnet retraction (Dunoyer et al, Plant Cell, 2004), but also proved his science as not reproducible. Jay et al 2011 was corrected for data manipulations, but deemed otherwise rock-solid. In 2016, Vance lab submitted their own preprinted manuscript to this same journal, disproving the photoshopped Voinnet study. They desk-rejected by the PLOS Pathogens editors (one editorial board member is a close Voinnet collaborator), after a prolonged deliberation but without peer review. The study was the published in the journal Plant Physiology (Mlotshwa et al, 2016). ETH knows all this very well, and so does CNRS. Le Monde suspects there might be new retractions, also Voinnet indicates those could happen if CNRS gets their way, but I am sceptical. Voinnet enjoys 100% support from ETH, and his networks in Europe and US are still strong enough. Prestigious journals are eager to publish his papers. Voinnet is back on his two feet, and he proved to big to fail. And this is the main lesson of how research integrity works. Another too-big-to-fail character, Catherine Jessus, solved her troubles with corrections, journals had to agree even if they didn’t seem to like it. Unlike Lopez-Otin, Jessus didn’t make the “mistake” of publishing with Journal of Biological Chemistry, who even do mass retractions if necessary. This is also why Lopez-Otin’s friend and his host in Paris, Guido Kroemer has nothing at all to fear in regard to his PubPeer record, neither from journals nor from his research institution Centre de Recherche des Cordeliers, which director he happens to be. And some journals don’t believe in corrections or retractions, like Molecular Cell (or Cell in general), this works in favour of former CNRS president Anne Peyroche, despite fraud findings. And some personalities are above such things. Or did you honestly expect a correction of this figure from the paper Vidal et al J Cell Science 2001, whose first author is presently Minister for Research and Innovation? The only public reply from the Government of France was to threaten legal actions against me for reporting this image duplication. And as for data irregularities in Wollman I am about to present: nobody will be interested. Sorbonne University will not even reply, no point of even trying. His Academie des Sciences were actually very active in endorsing Wollman’s whitewashing non-investigation of Jessus, while calling for the heads of critics and Le Monde journalist Larousserie (read here). They, the Sorbonne University and CNRS made their position about PubPeer evidence and my person specifically very clear. If the Voinnet affair happened now, he would probably be declared for his travails and retractions a martyr saint, as Lopez-Otin is in Spain. It is a huge mess, and it was only proper of CNRS to celebrate their 80 year anniversary with Jessus on stage. Let’s hope that the society journals where Wollman’s papers were published will care more. I will start with Cardol et al PNAS 2009, Wollman is penultimate of 6 authors. Somehow two images of a dish were reused, and rotated in the process. Can this happen by accident? There is more in that paper, again with images of culture dishes. The following can never be a mistake, you will always remember copy-pasting the right-hand half of an image, flipping it, rotating it, and then neatly pasting it over a different image, while meticulously covering up all traces of this image splicing event. If you did that kind of data manipulation, you will have done that with full intent to deceive. Whoever was responsible for this act of data fakery, we cannot know. What we do know is that Wollman is a certified expert for research integrity, and he must now decide which category this falls into: Voinnet-style or Jessus-style? “I am the only person responsible for the mistakes in mounting the figures”. There are other issues which might be have been mistakes, but they still should be corrected. Like this Wittkopp et al Plant Journal 2018, freshly published, hence easy to fix. If Wollman (who is 2rd penultimate coauthor) thinks it should be fixed, that is. Also this paper Malnoe et al Plant Cell 2014 is rather new, surely Wollman will want to correct this mistake of duplicated Ponceau S image (as reported on PubPeer a year ago) with correct data, being a known pedant for research integrity? Or maybe not. As the current scandals in France, Spain and other countries show, research integrity is not something our scientific elites are to be bothered with. All scientists are peers, but some get more peerage than the others. I did not previously realise that the unpaid post-publication reviewers who contribute to PubPeer have an obligation to find and report all the flawed or faked images in a paper, to save the researcher from having to search out (or remember) which images are faulty and need to be corrected. Yes, though what this also betrays is a high level of sloppiness, even negligence, during routine experimental operations. Very much in the vein of a creative artist, and how they may receive comments from art critics. Taking this point even further, and at the risk of entering well-worn argumentative waters, is Biology really a Humanities discipline in disguise of a Science Discipline? Perennial Nothern Blots over 23 times have been classic and tip of iceberg. We should recognize that Lopez-Otin malpractice has gone further beyond. It is much worse that they sell hope to progeria patients and swap their samples as shown in Nature Cell Biology paper (2015). Refer PubPeer. Their retraction note did not address the issues. CNRS has appointed a new interim head of biology branch to replace Jessus, Andre Le Bivic. Until his appointment on 1 February 2019, Le Bivic was director of Developmental Biology Institute of Marseille (IBDM). On 11 February 2019, Plos One issued an expression of concern for a 2013 paper from IBDM (last author Laurent Fasano). Raw data was either not available or didn’t match the published figures. This Director was Le Bivic. Now you know what his attitude to research integrity is. A worthy replacement for Jessus. With respect to Cardol et al in 2009, a correction has been published. The mistake when assembling the picture fortunately do not change the conclusions. Thank you for commenting on my site, Dr Cardol, also because I can reply here, unlike on PubPeer. I am afraid one cannot describe intentional image manipulations as “mistake”, maybe in a wider ethical sense, eg as a life lesson. I am the only person responsible for the mistakes in mounting the figures. So you may wish to amend your above article. With respect to figure 1, there was no image manipulation as you suspected but simply I cut a very similar picture from a wrong part of the file. If you are really interested by these details, I can send you my original files. With respect to supplemental figure 1, I still have a printed copy in my lab book but PNAS did not accept it for publication . In any case, the problem in the figure concerned only one strain which was not used in the main figures. Dr Cardol, thanks again for your reply. I think we can agree that with Figure 1 the reviewers and readers assume to have been looking at an unadulterated photograph of two cultures of cells next to each other. Instead, they were shown a Photoshop composite, where same image of one culture was rotated, flipped and pasted into a different photograph below. You define this as “mistakes in mounting the figures”, but it still strains credibility how such actions and misrepresentation could have happened by oversight. Figure S1 also has image duplications which suggest these were not accidentally copy-pasted, because the images were also rotated and flipped. We look at round cultures of cells, there is no top or bottom to orient, the only explanation would be: to hide the similarities. It would be good to have an expert feedback from your coauthor Dr Wollman here, given his extensive experience in investigating data manipulation or the absense thereof. I will update the article regarding the responsibilities, as you suggested. Thank you for having updated your article. It is your choice to think that I intented to deceive. I’m not sure to understand why you don’t choose to accept the idea that I made mistakes, with no intention to deceive. Fortunately these had no consequences because the correct spots (now published in the corrected figure 1) are virtually identical to the wrong ones (ultimately, this helps to understand why I made the mistake). At this stage, I doubt that I can convince you, even if I would show you all original data and the multiple intermediary versions of this figure. Believe or not but it took me a day to understand how it happened that I made these mistakes. Dr Cardol, I really cannot judge your raw data, or your motives. I merely stated what happened to the figure, and I presume you do not dispute this. May I ask if any of your co-authors was aware of how the figures were assembled? “This matter has been discussed with the authors and the editors have now seen the original materials used to compile this Figure. The journal is satisfied with the authors explanation that this was a compiling error when creating the composite image and a corrigendum will now be produced to correct this error”. “The authors supplied the original gel blots from their experiments from which the CPLD38 and CPLD49 lines in Figure 7 were compiled.